Figure A83. South Loyalty Basin anomaly, interpreted as the South Loyalty Basin slab, with (horizontal) [vertical] cross sections through (A)[D] the UUP07 p-wave) and (B)[D] the combined SL2013 and S40RTS s-wave models at 1110 km; C) the location of the modern geological record that we interpret to have formed during the subduction of the slab. The NW-SE trending South Loyalty Basin anomaly (Figure A83) is located below the Tasman Sea within the upper part of the lower mantle. It was first identified by Schellart et al. (2009). In the east, the flat-lying South Loyalty Basin anomaly is difficult to distinguish from the steeply dipping Tonga-Kermadec-Hikurangi anomaly, which makes estimating the depth of its base difficult. 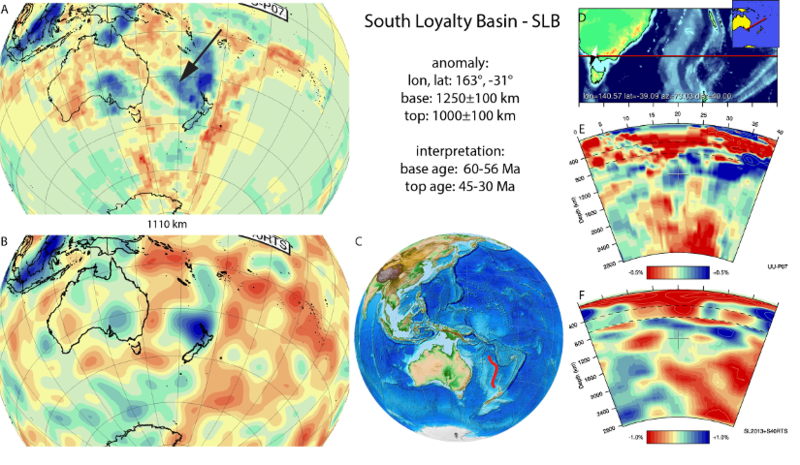 We follow the suggestion of Schellart et al (2009) and Schellart and Spakman (2012), and assign a 1000 to 1200 km depth range for the anomaly, which we interpret as the South Loyalty Basin slab. Its position west of the Tonga-Kermadec-Hikurangi slab requires a subduction location between the Tonga-Kermadec trench and Australia, where the geological record of the New Caledonia subduction zone (Schellart et al., 2009) is the only candidate for correlation. Schellart et al. (2006) estimated that this subduction zone was active from 50-45 Ma until 30-20 Ma. Matthews et al. (2015) suggested that subduction halted earlier, 45 Ma. The New Caledonia subduction zone terminated with the obduction of an ophiolite derived from the overriding plate forearc over a Paleozoic to Mesozoic volcano-sedimentary complex belonging to the Gondwana-derived Zealandia microcontinent (Luyendyk, 1995; Bache et al., 2013) on the island of New Caledonia. The ophiolite is underlain by high pressure, high-temperature amphibolites interpreted as a metamorphic sole, which was dated with 40Ar/39Ar on hornblende and U/Pb dating of zircons at ~56 Ma (Cluzel et al., 2012); sheeted dykes in the New Caledonia ophiolite have 53 Ma ages (Cluzel et al., 2006). This shows a somewhat earlier onset of New Caledonia subduction than previously interpreted, likely a few million years before the ages derived from the sole. We adopt a 60-56 Ma subduction initiation age and a 45-30 Ma break-off age in conjunction with the recent kinematic restoration of van de Lagemaat et al. (2017).